Dementia is a loss of brain function that occurs with certain diseases. 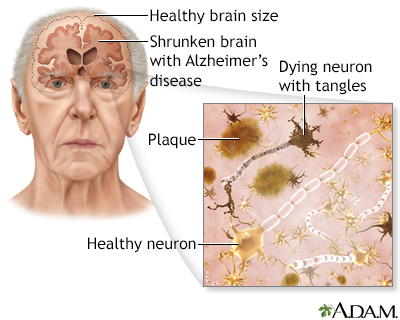 Alzheimer disease (AD) is the most common form of dementia. It affects memory, thinking, and behavior. The exact cause of Alzheimer disease is not known. Research shows that certain changes in the brain lead to Alzheimer disease. Are older -- Developing Alzheimer disease is not a part of normal aging. Have a close relative, such as a brother, sister, or parent with Alzheimer disease. Have certain genes linked to Alzheimer disease. Early onset Alzheimer disease -- Symptoms appear before age 60. This type is much less common than late onset. It tends to get worse quickly. Early onset disease can run in families. Several genes have been identified. Late onset Alzheimer disease -- This is the most common type. It occurs in people age 60 and older. It may run in some families, but the role of genes is less clear. Alzheimer disease usually first appears as forgetfulness. Mild cognitive impairment (MCI) is the stage between normal forgetfulness due to aging, and the development of Alzheimer disease. People with MCI have mild problems with thinking and memory that do not interfere with daily activities. They are often aware of the forgetfulness. Not everyone with MCI develops Alzheimer disease. A diagnosis of Alzheimer disease is made when certain symptoms are present, and by making sure other causes of dementia are not present. CT or MRI of the brain may be done to look for other causes of dementia, such as a brain tumor or stroke. Sometimes, a PET scan can be used to rule out Alzheimer disease. The only way to know for certain that someone has Alzheimer disease is to examine a sample of their brain tissue after death. What are the side effects? Is the medicine worth the risk? Do medicines for other health problems need to be changed or stopped? Someone with Alzheimer disease will need support in the home as the disease gets worse. Family members or other caregivers can help by helping the person cope with memory loss and behavior and sleep problems. It is important to make sure the home of a person who has Alzheimer disease is safe for them. It is important to make sure the homes of people who have dementia are safe for them. Having Alzheimer disease or caring for a person with the condition may be a challenge. You can ease the stress of illness by seeking support through Alzheimer disease resources. Sharing with others who have common experiences and problems can help you not feel alone. How quickly Alzheimer disease gets worse is different for each person. If Alzheimer disease develops quickly, it is more likely to worsen quickly. People with Alzheimer disease often die earlier than normal, although a person may live anywhere from 3 to 20 years after diagnosis. Families will likely need to plan for their loved one's future care. The final phase of the disease may last from a few months to several years. During that time, the person becomes totally disabled. Death usually occurs from an infection or organ failure. Stay on a low-fat diet and eat foods high in omega-3 fatty acids. Stay mentally and socially active. Wear a helmet during risky activities to prevent brain injury. Aged nervous tissue is less able to rapidly communicate with other neural tissues.